This is the third installment in February’s Fab Four Fables. 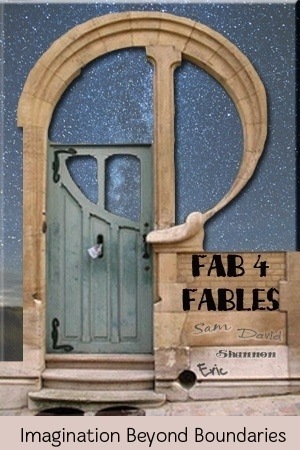 David started us off with a fantasy tale that left it open for the story to take many different directions – read his here: http://scholarlyscribe.wordpress.com/2013/02/07/fab-four-fables-a-merchant-in-oria-part-one/. Eric used his in depth fantasy background to further the adventure here: http://sinistralscribblings.com/2013/02/08/a-merchant-in-oria-part-two-a-fab-four-fable/. Now, to continue our tale of humans and dwarves and trolls, I offer you this. I hope it is as enjoyable to read as it was to write because I had a hell of a lot of fun. SAM at www.frommywriteside.wordpress.com will use her talent to bring Kheldar’s story to a close. As Kheldar was marched out of the town via a path that barely deserved to be called one, he tried to concentrate on his biggest problem. Trolls. The Dwarves had made a treaty with the Trolls! They were going to turn him over to the Trolls for who knew what nefarious purpose. A snack? Slave labor? Sport? And yet…this uncertain future paled in comparison to his current predicament. He was being prodded along, wearing nothing but his small clothes. Kheldar, who couldn’t bathe with the other merchants and only changed behind hastily erected partitions when the need struck on the road, was being pushed along in his under things. His horror at this continually overlapped his greater terror at being Troll fodder. A rough voice sniggered as Kheldar attempted to keep his sensitive bits hidden behind his hands as he walked. “A shy little lamb of a human, huh?” the guard clumping along slightly behind his right shoulder asked. “Stone devils pay well and keep you treaty breaking lying weak willed sacks of skin out of our mines, so don’t you worry about what we higher races do, filth,” said the guard on his left, clouting him on the side of the head without heed to the directive of non-harming imposed by Dahn. A smile that did not enhance the squat features spread wickedly across left-hand guard’s face. “Ask your father.” He shoved at Kheldar with his boot, knocking his feet out from under him and sending him sliding down a steep incline into one of the many other holes in the ground. The smell was ferocious and the ride was rough, dumping him out at the bottom onto a floor covered with waste and slime. For as slowly as the next few cycles of the sun passed at the bottom of Minesink 42, Kheldar did a lot of fast thinking. Firstly, he had to let go of his childhood fantasies of the glories of the Dwarven kingdom. An entire lifetime of daydreams, up in smoke like the still sinister column of black that continually darkened a corner of what sky he could see. He wept, just a little, as is befitting the death of a dream, and then let it go. The little bit of softness that remained of youth burned off as he was ‘exercised’, which consisted of random and sarcastic dwarves dropping a rope down the shaft for him to climb up to receive his one bucket of gruel and better left unknown gristly bits per day. He kept his eyes averted, his mouth closed, and his shoulders bowed. When his gorge wanted to rise, he forced it down, eating and shimmying back down to his pit without complaint. As his hands grasped the flung down rope, one over the other without thought, a little voice of panic yammered away in the back of his skull. Trolls. Trolls! He had never wanted to meet any trolls, had harbored no desire for a face to face with one of the eldest Earthen tribes, terrifying and stupid and cruel. Of course, he had thought the Dwarves would be enlightened and welcoming, so assumptions weren’t always to be trusted. Seeing as there had never been a tale told of a friendly Troll or a meeting with them that did not result in any humans who weren’t quick enough to get away ending up in the cookpot, Kheldar felt comfortable in his belief that he most definitely did not want to meet them. Their journey out of Oria began without ceremony, although plenty of its inhabitants took time out for a little peer and jeer. There were six in the party, and one cart to carry food and drink. Kheldar’s own oxen were hitched to the cart; he surreptitiously scratched behind the ears of the abused looking animals as he walked past and they lowed in response, tired eyes rolling in their heads. Anger bubbled like a sick stew in his stomach. A rope was fastened into a loose fitting noose around his neck and tethered to the back of the cart, his hands bound in front of him. They had given him an ugly dung colored tunic, but no leggings, and some soft strips of cloth to tie around his feet. He still felt exposed but could no longer be bothered to care about it very much. The dark and oppressive forest waited just around the corner; their entire passage to Gormadth would be through the Stragnon Woods. The thought turned Kheldar’s bowels to water, and so he opted instead to ponder what they had meant when they told him to ask his father about human treaty breakers. His father had always been an upstanding man, forthright and honorable. Kheldar himself had found him to be so, and had never heard a harsh word spoken against him amongst their tribe or any of the merchants on the trade routes he had worked these past years. Very puzzling, indeed. As he turned things over in his mind, the procession took its first steps into the murk. In a blink the sky became barely visible through the canopy of oversized sickly green leaves far overhead, sound became a muted buzz, and even the Dwarves walked a little taller, which wasn’t all that tall, and swiveled their heads from side to side incessantly. Kheldar grabbed his lead rope with both hands and yanked with every ounce of strength that he had left. The axle popped loose, the cart canted to its side, and Kheldar bounded away into the forest dragging it with him. He leaped over a stagnant crick and crashed through the undergrowth, all the while fighting the noose around his neck with his hands. He finally ducked out of it and left rope and axle amid the high grass, fleeter of foot without it dragging him down. He ran heedlessly deeper into the darkness. Hours passed, and Kheldar finally stopped. 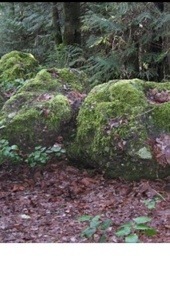 He slumped against an enormous tree trunk and slid to the ground, bone weary. He couldn’t have run any further had the very hounds of Damascar been at his heels. Love it, Potts! Talking boulders? Excellent!